Eggplant, peppers, basil, volunteer lettuce, and our new cat, Jasper, who loves to march through (and roll around in) all the garden beds. Want to see more? You'll find photos of what's happening each week in my kitchen garden (and all around the farm) in the Friday Farm Fix series on Farmgirl Fare. Every few weeks this spring I've been taking pictures of each of my raised garden beds, but I never get around to posting them. Sometimes I forget, sometimes I'm busy in the garden, and sometimes parts of the garden are kind of a mess and things just don't look good enough. 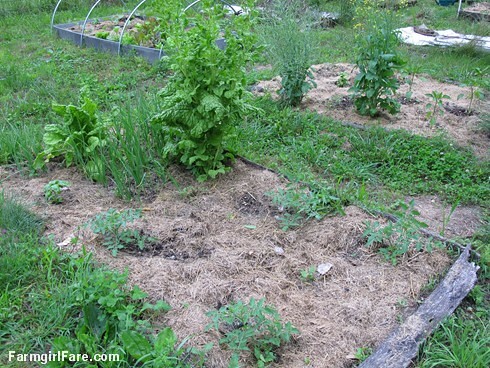 (You may have noticed the overgrown walkways, unsightly cardboard mulch to kill/prevent weeds, and tangle of tomato cages with last year's dried tomato plants still clinging to them in the photo above). That "good enough" nonsense needs to stop. Real gardens aren't perfect—at least mine never will be—and it's the imperfect details that often teach us the most. And any garden journal photos are better than no photos. It's amazing how much stuff I completely forget I even grew until I see old photos. I am apparently incapable of writing a short garden blog post, even when it's mainly supposed to be pictures. It's hot and humid, 90 degrees in the shade and headed higher. There's a saving grace breeze, but by late morning it feels like a giant noiseless hairdryer. Joe is out on the tractor raking up our second cutting of hay. All the animals are napping in the shade. We've reached an annual turning point in the kitchen garden, and it's time to face the truth. Most of the seeds you ordered are still sitting in the freezer. It's too late to start any more spring or summer crops, and the rest of the poor little tomato plants you bought back in April and still haven't put in the ground (or transplanted into bigger pots, or even fertilized) have turned a disturbing shade of purplish black. So many plans for the garden this year, so few of them actually accomplished. Again. But then you realize that all of this no longer matters, because after spending half an hour watering out in the blazing sun yesterday morning (I love these garden hoses), you've managed to permanently sweat away your appetite. What's planted is planted, and suddenly it seems like more than enough. 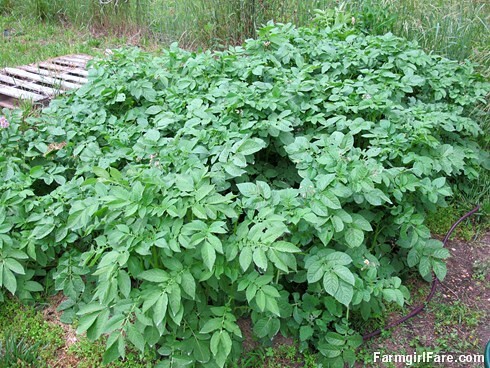 Who wants to eat 56 feet worth of potatoes in July and August anyway? All you can think about are crisp, cool salads and really tall, ice-filled drinks. And then the realization hits. 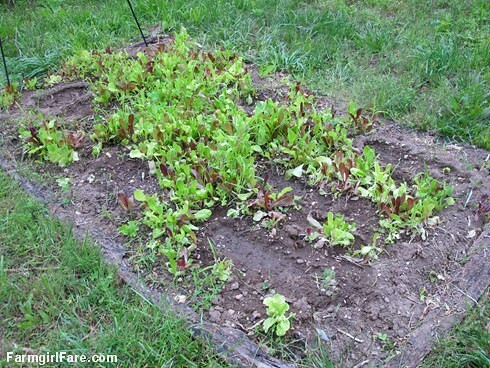 You were so busy enjoying all that lovely over-wintered Swiss chard and kale, and then the spring-planted gourmet baby lettuce mix, not to mention all those big beautiful heads of volunteer lettuce from last fall's salad patch, that you conveniently forgot to start any heat tolerant greens for summer salads. Now all those potatoes are starting to sound pretty good. Picture perfect or not, here's what's growing in my garden right now. There are a also few herbs and flowers tucked here and there, and the homemade greenhouse is full of lemon balm and bolting Swiss chard, but this is the bulk of things. All photos were taken June 9th, except the cucumber and pepper bed which was taken yesterday because I forgot it on the 9th. 11 more photos below, descriptions of each at the end. . .
1. Classic and Black Beauty eggplant (purchased), Golden California Wonder peppers (purchased), basil (purchased), volunteer lettuce (all picked yesterday before this heat wave), and our new cat Jasper, who loves to march through (and roll around in) the garden beds. 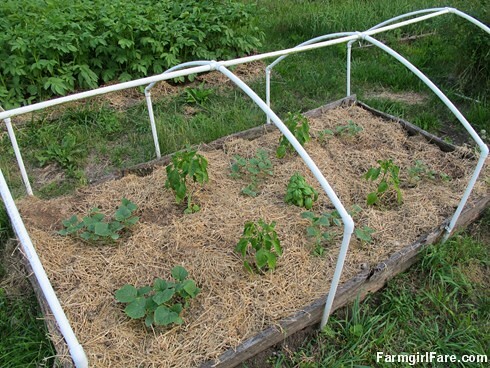 I've been clipping an old bed sheet to the metal hoops to make shade for the lettuce. 2. The biggest heads of garlic from the 2012 harvest were planted on March 11th (ideally they should gave gone in the ground way back in October). I picked the first green garlic yesterday. 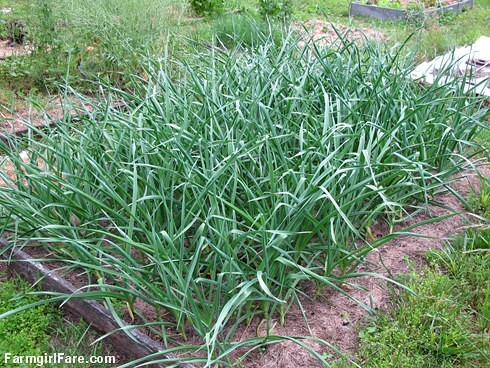 You can read more about green garlic here and learn how to grow your own garlic here (it's easy!). 3. Rocky Top lettuce mix from Baker Creek Heirloom Seeds direct seeded (a little too thickly, but it keeps down the weeds) on April 13th. Harvested the bulk of it a few days ago before it got really hot and then planted 8 Roma tomato plants (bought ages ago) in there. 4. 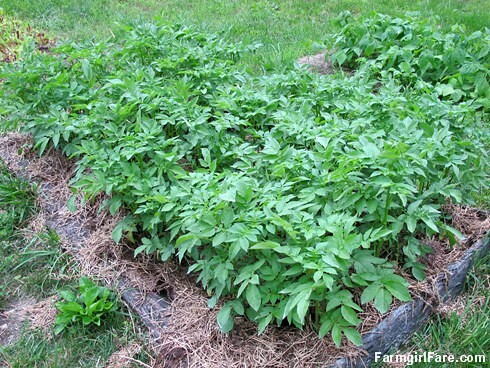 Yukon Gold potatoes planted in early May, growing like crazy and finally mulched this week with a thick layer of hay/sheep manure from the barn. 5. Lemon cucumbers, miniature white cucumbers, and Boston pickling cucumbers direct seeded (2012 seeds) some time in May and Big Bertha peppers (purchased). 6. 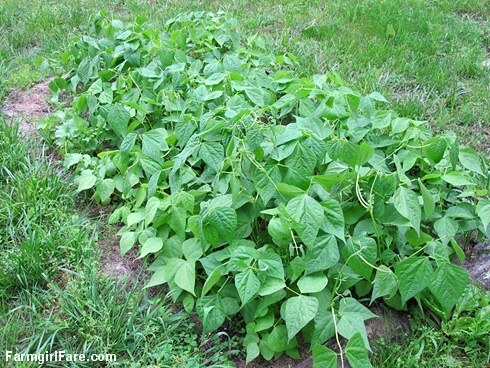 Masai, Maxibel, and Dragon Langerie (aka Dragon Tongue) bush beans, three longtime favorite varieties. The Maxibel are looking a little too tall; I'm thinking they may actually be pole beans. There was also a 4-foot row of beautiful French Breakfast radishes in here; picked the last of them this week. Totally forgot to succession plant any more. 7. Candy, Red Candy Apple, White Bermuda, and Texas 1015 Super Sweet onions, purchased as plants from Dixondale Farms back in March, left in the house way past their supposed three week out-of-ground lifespan, and still doing just fine. 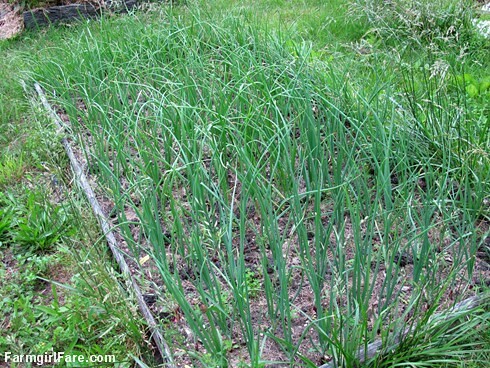 I double planted so half could be harvested for green onions, which we've been eating on everything. 8. Red Pontiac (and a few Yukon Gold) potatoes, planted April 4th, survived a freeze, and now currently being attacked by Colorado potato beetle larvae. 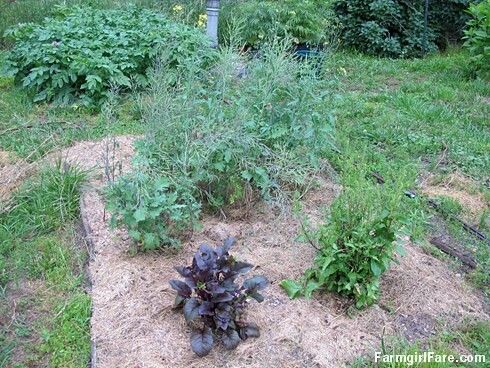 I sprayed once with a mixture of garlic juice, food grade diatomaceous earth (we buy this wonderful stuff in 50-pound bags and use it all over the farm), dish soap, and vegetable oil which didn't seem to help all that much, and between the rain (yay!) and my laziness I haven't gotten around to spraying again. Instead, every time I walk by I hold a bucket of water under the plants and knock the larvae into it. It's actually working pretty well. 9. Bull's Blood beet (the leaves are beautiful and tasty in salads) and some other kind of beet plant, plus Russian Red kale gone to seed, all from last fall. 10. More kale from last fall gone to seed (I'm crazy about kale and eat all mine raw in salads), plus a few new volunteer plants that recently sprouted up. This bed will soon be planted with peppers and/or tomatoes (the ones that aren't nearly dead); cardboard at the edge covers weeds and keeps more from growing. 11. Sweet 100 cherry tomatoes (purchased), basil (purchased), few Texas 1015 Super Sweet onions that didn't fit in the onion bed, and two Swiss chard plants from a year ago. 12. Permanent chive border, two kale plants from last year gone to seed, King Arthur peppers, Rutgers tomatoes, and basil (all purchased plants). For various reasons the garden hasn't been getting enough attention for the last several years, and only about half of my 4'x8' (mostly falling apart) raised beds are currrently planted. But it looks better and is bigger than it's been in a long time; some of the newly reclaimed beds are ones that had been neglected for years. There was a tree growing in one of them. Hungry or not, this progress in the garden makes me very happy, especially since all the planted beds are already also nicely mulched. Woohoo! Yes, I get that excited over grass clippings. Slowly but surely I'm catching back up, while at the same time my list of garden plans keeps steadily growing. Someday I may even get back to starting all my own seeds. The varieties of non-hybrid tomato, eggplant, and pepper plants available for sale locally are very limited—and really boring. In the meantime, who's up for a big bowl of ice cream? And then maybe a nap in the shade while dreaming about a glorious harvest of cool season autumn crops. So how's it going in your June garden? Are you harvesting anything yet? Did you get everything planted that you wanted to? © FarmgirlFare.com, the homegrown foodie farm blog where Farmgirl Susan shares recipes, stories, and photos from her crazy country life on 240 remote Missouri acres—and there's nothing like some freshly picked food to stimulate your appetite. I like your garden. I no longer garden (except for herb gardens on my deck and window boxes) but I have had pristine gardens and messy gardens. The messy ones always did better! Manicured gardens are kind of ridiculous if you think about it. 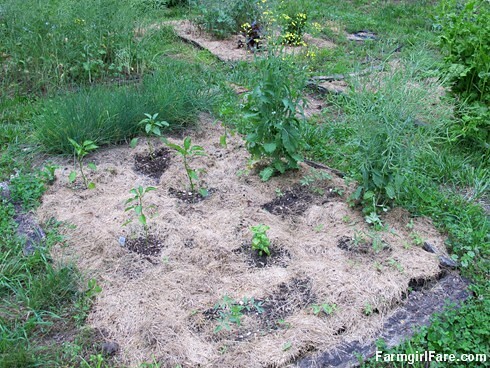 Cardboard is good mulch and even tall weeds can make shade in hot environments. You have a lot of great stuff planted. Thanks for sharing. Hope it doesn't get so hot this summer. Yes, I will take some iced cream, thank you! Hugs to the critters, especially the donks! I feel so much better when I realize that other people have messy gardens too! Am having my first salad tonight, kale is almost ready to start picking. tomatoes planted in containers with local fish manure are looking amazing, and potatoes are growing fast and...so far...bug free. Something in eating the beans as they break ground so am trying eggshells, wood ashes, and sand.....we'll see who lives! Oh my goodness - your garden is crazy beautiful! I don't have a proper garden, but still trying in a place that doesn't get enough sun and, in spite of compost, the plants look a little....wan. Never give up! I just love your gardens! Did you peek into my garden when you wrote this? Mine is the same mess...here dandalion, burdock, clover and buttercups have taken over the walkways between my 16 4x8 raised beds. As usual the weeds are doing better than the seeds. I have more chives than I'd ever know what to do with. The lemon balm could infuse tea for all of China. Direct seeded squashes of all sorts are popping up through the soil and finally look good. Red onions are also starting to take off. Cukes, tomatoes and yellow corn are horrid looking because of the constant rain and cold temps we have had. Whats doing best? Indian corn I just direct seeded off the dried cobs from last years autumn decorations. No bugs so far...I think its too cold for them. That looks like the normal state of my garden! The only reason mine looks neater right now is because my father is staying with us and he goes out and pulls weeds every so often. Your plants are growing really well. I live in NY and the weather is so insane here - 90˚ one day and 50˚ the next, heavy rains, heavy wind, periodic tornado conditions, hot and oppressively humid and then the occasional perfect day when everyone runs out to try to get as much done as possible before the weather changes again and nothing seems to be growing well at all. It's like the plants are confused. My tomatoes look exactly the same as they did a month ago when I planted them, even though they've been fed and lord knows we've had enough water with all the rain. Glad to see something is growing somewhere! i love your garden! i love a garden that is wildly tamed. you have got a lot of goodies in those beds, amazing. Followed on over from todays soulemama post - and I have to say I love this! I often look at my garden (and yard) in dismay. Broken weedwhacker, overgrown paths, peas not trellised well - and it's not quite the site garden dreams are made of! I'm so glad to see there are other "good enough" people out there! I've got chard in spades. I've got little yellow cherry tomatoes that now, suddenly, are all cracked. I've got small purple beauty peppers in a pot, and I'm not sure when to pick them. I've got a million green tomatoes on vines throughout my garden but none are turning red yet. My basil is looking good, and my squash, so far, is producing enough to stir-fry every two days. My hoja santa looks sickly, my epazote looks charred, my mexican oregano, greek oregano, rosemary and lemon grass are looking okay. I've got one hot pepper out there that is beautiful and looks great, and I've got about 5 other pepper plants that have nothing on them. Why????? My okra is now kicking in, but it needs a few more hot, dry days. (I have no doubt they will come.) My big problem right now is the arrival of the stinkbugs. Do you have them in Missouri? I'd like to crack their pointy little heads together. Does anyone have any spectacular remedies to kill them? Like others, I am relieved to see a garden that is not picture perfect. 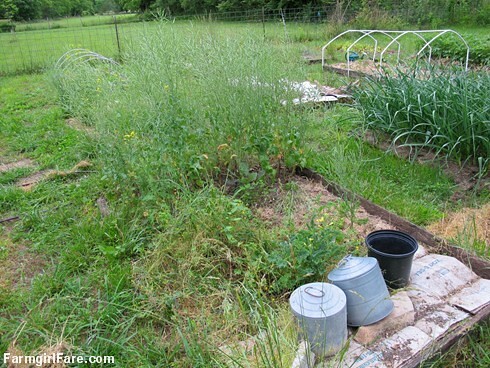 In my traditional garden plot, I have a lot of stubborn grass-like growth while the plants in several hay bales are a ready made salad bowl for chipmunks. Thanks so much for all your nice comments. I love to hear what's happening in your gardens. As for the whole un-picture-perfect thing, I've come to realize that one of my reasons for being in the garden blogging universe is to help spread the 'real life' gardening word - that homegrown food still tastes wonderful even if your garden is a mess, that even if you abuse your seedlings and are constantly behind, you can still grow a good garden. speaking of the Colorado Potato Beetle- I had it attacking eggplant and peppers last year. I companion planted sage next to the plants (after I first saw the beetles), and it kept them away from then on. I have no idea if it would work for the potatoes as well, but might be worth considering, since they are nasty little buggers. Plus, a good reason to plant more sage! My garden is poised to overrun me and my best intentions...it does so every year. Every year I learn and every year it gets better but there is always a struggle. My battle with the flea beetles is about over and the eggplants are looking good. The cut worms gave me a pass but the peppers still look blackened and "holey". I suspect too much rain is to blame. Tomatoes look wonderful and the herbs are fine too. We have been eating lettuce and greens for a month + and even a little spinach. Radishes were monumental. Peas and snap- peas are going nuts. we have been giving them away and still we have too much. It is because of on-line (and in person) communities that my knowledge expands-along with my waistline. We just planted our garden here in Northern MN last Saturday (June 15). Always feels good. However, need to plant 2 more cucumber plants and dill and basil seed. I love to hear and see what's happening in your garden (mostly for the advice)! Real life happens, we're just so reluctant to let it so! I finally got our gardens all planted here in Northern Vermont June 9th. Except for a couple of leftover jalapeno plants I just couldn't bear throwing over the bank so I stuck them in with the yellow squash on Saturday! The lettuce's are just peeking through the ground and that's about it. Looking forward to seeing what the next two weeks bring in your garden! I am overjoyed to say that this year's garden looks really good. Of course, considering the state of LAST year's garden, it could hardly look worse. Thanks, July baby! The weed seeds from last year's mess are sprouting constantly in terrifying numbers, but I've been very diligent with the hoe and the mulch and I think it will get better. I'm going to be fighting last year's weeds for the next decade though, I bet. I love your garden. It looks a lot like mine, actually. 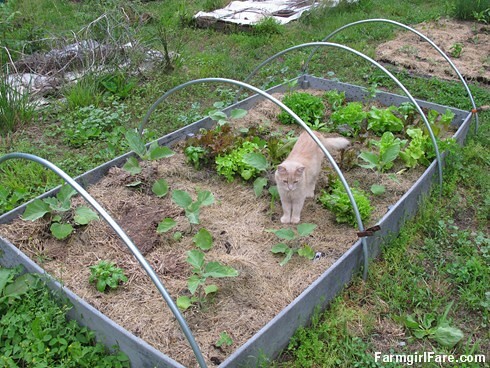 It's nice to go on Pinterest and see all the pretty weedless gardens with their perfect paths and neat rows, but in reality I prefer a more natural garden. I hear that about how tough it is to keep blog posts short. I just started my own blog and its been a lot of editing down. Oh, I loved looking around your garden! So nice when you find people who are doing similar things to yourself :) Thanks for finding me over at pinterest!